A high pressure ridge is still off the coast but there are lots of mid and high clouds moving through it. Over the next few days the ridge will shift back to the west. 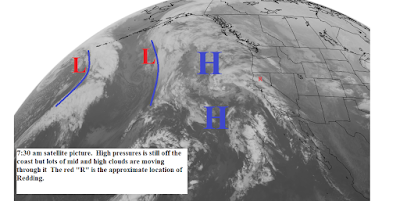 This will allow low pressure troughs and frontal systems to drop southward along the coast and over Northern California. These systems will start off weak but get stronger toward the end of the week and the weekend.